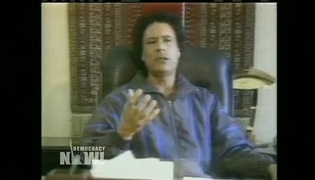 Thousands Feared Dead in Gaddafi’s Crackdown on Libyan Uprising | Democracy Now! Democracy Now! correspondent, reporting from Libya. JUAN GONZALEZ: I’m Juan Gonzalez in New York. Amy Goodman is joining us from Wisconsin’s State Capitol building in Madison, where hundreds of people have slept overnight. Amy? Amy? AMY GOODMAN: I’m Amy Goodman, here in the Capitol building. Hi, Juan. We’re here in the Wisconsin Capitol building. And I just wanted to say, if we can go first to Anjali, who has made it into Libya, with her report, we’re then going to come back here to another uprising. From the Middle East to the Midwest. In the Capitol building, hundreds have slept overnight. Thousands of people remain during the day in a 24-hour vigil as people are trying to stop Governor Walker’s anti-union bill from ultimately passing, not only the Assembly, which it did just a few hours ago, to the chants of Assembly Democrats, “Shame! Shame!” but in the Senate, as well. We’ll bring you the latest. We’ll also be joined by the head of the firefighters’ union, the head of the police union. But Juan, why don’t you introduce Anjali Kamat first. JUAN GONZALEZ: Sure. Well, we’ll turn to Libya first. On Thursday, as fighting intensified around the capital city of Tripoli, Colonel Muammar Gaddafi planned al-Qaeda and hallucinogenic drugs for the uprising in the country. Fighting between pro- and anti-Gaddafi forces appears to be the most intense in al-Zawiyah, 30 miles west of the capital. Clashes have also been reported in other parts of the country, including in Misurata, Libya’s third-largest city. The Obama administration has said the situation in Libya “demands quick action.” The U.N. Security Council is meeting today to discuss possible sanctions as the violence in Libya continues. Some rights officials estimate the death toll could be as high as 2,000. According to reports, protesters are preparing for their first organized demonstration in Tripoli today. The New York Times reports residents have received text messages informing them of a protest throughout the city. Meanwhile, Al Jazeera Arabic reports Gaddafi’s security forces are deployed around mosques to prevent protests after Friday prayers. Democracy Now! correspondent Anjali Kamat traveled to Al Bayda in eastern Libya yesterday. We reached her last night. ANJALI KAMAT: What’s special about Bayda is that the residents there say that it’s the very first city in Libya’s east that broke free of Gaddafi’s 42 years of authoritarian rule. People in Bayda are extremely excited to be liberated from Gaddafi’s rule. There’s no security forces to be seen on the streets. There’s no visible presence of the Gaddafi regime. Everywhere, there’s the flag of the pre-Gaddafi government, the Senussian flag, all over the city. Al Bayda was the site of very fierce battles exactly a week ago. And I visited the main hospital in the city. It’s actually the only public hospital, and it’s now called the Hospital of the Revolution. And I spoke to a number of doctors and nurses and patients there. And even though it’s been a week since the battle, there’s still dozens of critically wounded patients inside this hospital. These are mostly young men between the ages of 15 and 30. They’ve been very seriously injured, and most of them will probably be handicap for the rest of their lives as a result of these injuries. We saw some of the ammunition that was used against demonstrators by the pro-Gaddafi security forces and by mercenaries hired by the Gaddafi regime against these protesters. They included live ammunition as well as much larger — what doctors called anti-aircraft artillery, you know, incredibly large-looking bullets that were pulled out from the bodies of wounded and killed protesters. Many of the patients that I spoke to talked about being — coming out to the protests being very inspired by what they had seen on their televisions from the scenes from Tunisia and Egypt. And when they saw what happened in Tunisia and when they saw what happened in Egypt, they felt that they had to rise up, as well, against their dictatorship in their own country. And they talked about going out in largely peaceful protests. They were armed only with stones and rocks, and they were met with very heavy machine-gun fire. They were fired upon by Gaddafi’s security forces as well as mercenaries. And some of these mercenaries were captured by citizen groups in Al Bayda. And we talked to some of the hospital staff, as well as patients, about these mercenaries. They uniformly said that all of the mercenaries were foreigners, were not Libyans, but what we heard from some of the doctors and nurses was that some of the mercenaries had admitted to the doctors that they had been paid quite well by Muammar Gaddafi in order to come and attack protesters in Al Bayda. You know, everywhere we went in Al Bayda, it’s quite remarkable to see all of the public institutions are guarded now by civilians. The traffic — there’s no traffic police, so there’s groups of young men directing traffic. The banks opened for the first time today in a few cities in the east, and all the banks are being guarded and operated by groups of civilians, taking control and making sure that there’s no looting. We saw signs in different places saying, “Protect Libya. Don’t loot. Don’t damage anything. We want a country that’s not going to be ripped apart by sectarianism, by tribalism. We’re going to stand together as Libyans.” People are very excited about having this chance for freedom. And I think at this moment, people are watching the scenes of extreme violence taking place in western Libya, in Tripoli and Zawiyah, and everyone’s really hoping that these cities in western Libya will also fall and also be liberated in the coming weeks. JUAN GONZALEZ: That was Anjali Kamat, Democracy Now! correspondent, on the phone yesterday from Tobruk in eastern Libya.